The mechanical screed is being used more and more in construction for striking off concrete slabs on highways, bridge decks, and deck slabs. This screed incorporates the use of vibration and permits the use of stronger, and more economical, low-slump concrete. It can strike off this relatively dry material smoothly and quickly. The advantages of using a vibrating screed are greater density and stronger concrete. Vibrating screeds give abetter finish, reduce maintenance, and save considerable time due to the speed at which they operate. Vibrating screeds are also much less fatiguing to operate than hand screeds. 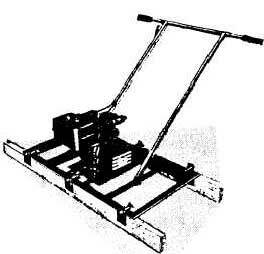 A mechanical screed (figure 7-45) usually consists of a beam (or beams) and a gasoline engine, or an electric motor and a vibrating mechanism mounted in the center of the beam. Most mechanical screeds are quite heavy and usually equipped with wheels to help move them around. You may occasionally encounter lightweight screeds not equipped with wheels. These are easily lifted by two crewmembers and set back for the second pass if required. The speed at which the screed is pulled is directly related to the slump of the concrete - the less the slump, the slower the speed; the more the slump, the faster the speed. On the finishing pass of the screed, there should be no transverse (crosswise) movement of the beam; the screed is merely drawn directly forward riding on the forms or rails. For a mechanical screed, a method is provided to quickly start or stop the vibration. This is important to prevent over vibration when the screed might be standing still. Concrete is usually placed 15 to 20 feet ahead of the screed and shoveled as close as possible to its final resting place. The screed is then put into operation and pulled along by two crewmembers, one at each end of the screed. It is important that sufficient concrete is kept in front of the screed. Should the concrete be below the level of the screed beam, voids or bare spots will appear on the concrete surface as the screed passes over the slab. Should this occur, a shovelful or so of concrete is thrown on the bare spot, and the screed is lifted up and earned back past this spot for a second pass. In rare cases, the screed crew will work out the void or bare spot with a hand-operated bull float, rather than make a second pass with the screed. The vibration speed will need to be adjusted for particular mixes and different beam lengths. Generally, the stiffer the mix and the longer the beam, the greater the vibration speed required. The speed at which the screed is moved also affects the resulting finish of the slab. After a few minutes of operation, a satisfactory vibration pulling speed can be established. After the vibrating screed has passed over the slab, the surface is then ready for broom or burlap finishing. Where possible, it is advisable to lay out or engineer the concrete slab specifically for use of a vibrating screed. Forms should be laid out in lanes of equal widths, so that the same- length screed can be used on all lanes or slabs. It should also be planned, if possible, that any vertical columns will be next to the forms, so that the screed can easily be lifted or maneuvered around the column. There are four important advantages of using a vibrating finishing screed. First, it allows the use of low-slump concrete, resulting in stronger slabs. Second, it reduces and sometimes eliminates the necessity of hand tamping and bull floating. Third, it increases the density of the concrete, resulting in a superior wearing surface. And fourth, in the case of floor slabs, troweling can begin sooner since drier mixes can be used, which set up more quickly.